On May 14, 2018, the Supreme Court ruled that the Professional and Amateur Sports Protection Act (PASPA) is unconstitutional, changing the future of sports betting in the United States. ESPN Chalk is here to keep you up-to-date and informed. Here is our landing page for all our analysis and news from our gambling experts. The Supreme Court ruled that PASPA is unconstitutional. Can I gamble legally on sports now? The Supreme Court has overturned PASPA in its decision on the New Jersey gambling case. In which states can you now bet on sports? Can you bet online? Here is an FAQ on the most pressing post-decision questions. Billions will be wagered at new legal sportsbooks across the United States. The NBA and MLB are angling to reap some of the profits. Could legalized gambling cause problems in NBA? The Jump crew weighs in on how the NBA's Last Two Minute Report may impact legalized sports gambling in the future. With every U.S. state now available to offer sports betting, professional sports owners are among the big winners. But what about Twitter, illegal bookmakers and the NCAA? We run through winners and losers. The path to legalization of sports betting was a long one. David Purdum looks back at the reign of PASPA and how it got struck down. Don't worry, you're not alone. Many will be new to sports betting following the SCOTUS ruling, so we ran through some basics you might want to know. With every state in the U.S. now eligible to offer sports betting, we take a look around the world at countries where gambling is legal (and also where it is not) to find out what impact it has had culturally and economically. The Supreme Court has ruled on New Jersey's sports betting bill and PASPA is unconstitutional. 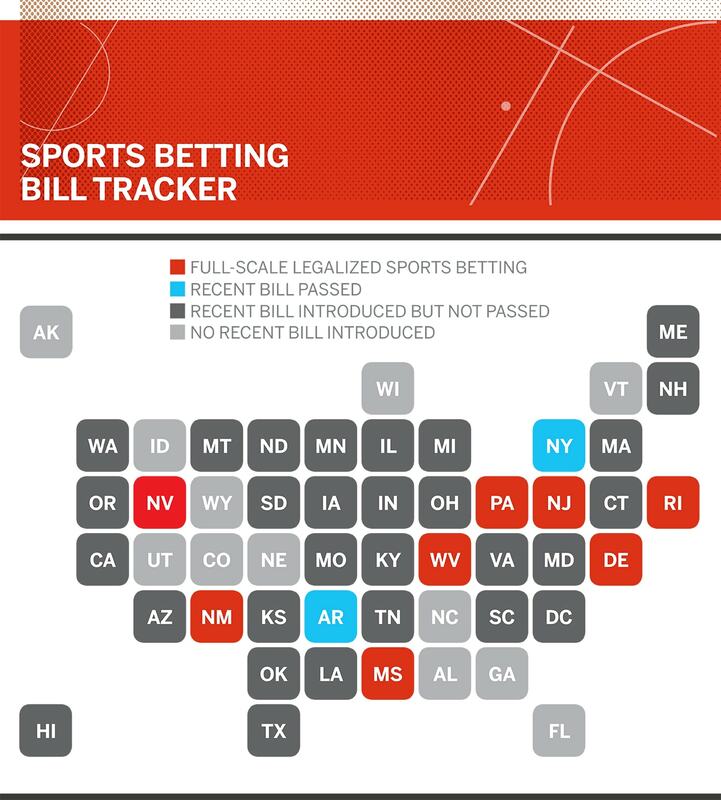 Which other states are pursuing bills to legalize sports betting? Here is a tracker with the latest legislation. The NBA has been on the leading edge of legalized sports betting. But what does the Supreme Court decision mean for the league and how will it affect the game? How will legalized sports betting impact the NHL? Our NHL panel looks at the potential effects of the SCOTUS ruling on gambling in the world of hockey betting. Brent Musburger joins OTL to break down how legalized sports betting will affect the gambling industry in Nevada and beyond. How will the U.S. Supreme Court's decision to allow sports betting impact soccer? If anything, it might actually cut down on corruption. Can legalized sports betting boost horse racing? Beyond the spectacle of the Kentucky Derby and its Triple Crown brethren, will horse racing stand to benefit in a post-legalization world? If gambling brings more money and eyeballs to women's sports, that's a good thing. Does the SCOTUS sports betting ruling help in the legalization efforts of online poker? With legal sports betting on the horizon, online poker legislation has mostly fallen behind. Will that change after the Supreme Court ruling? How are league's preparing for legal sports gambling? Ryan Smith, David Purdum and Brian Windhorst join OTL to dissect how the Supreme Court's ruling to lift the ban on sports gambling will impact the landscape. NASCAR should get a boost in exposure thanks to the Supreme Court ruling opening up sports betting to all states, but don't expect it to be a gold mine from the start. Here's what to expect in the near future and beyond for esports. The Oakland Raiders are moving to Las Vegas, but for many years it was far from a certainty. This is the story of how a former Raiders running back, a UNLV professor and a 113-page report on sports betting helped ease the Raiders' concerns about Sin City. Betting on a Premier League game in an NBA arena hours before the game tips off that night? Suites with big-time gamblers' favorite shampoo and amenities? Darren Rovell provides a look at what the future of U.S. legalized sports betting could look like. It took over six years, but New Jersey finally prevailed and will have legalized sports betting. Here is a fun look at how the state's odds changed over the course of its legal battle. Stephen A. Smith and Max Kellerman weigh in on the Supreme Court's decision to allow states to decide on legalized sports betting. Will Vegas ever be the same? For Vegas bookmakers, 2017 was a very good year. But following the Supreme Court's ruling in the New Jersey, their futures are far from certain. How could Supreme Court ruling affect Vegas? 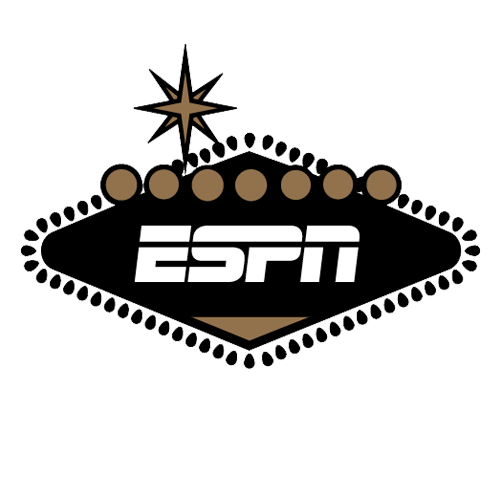 ESPN legal analyst Ryan Smith weighs in on the ramifications for Las Vegas now that sports betting has been legalized. The NFL has had a decades-long adversarial public relationship with sports betting. Here is a collection of quotes, from Pete Rozelle in 1963 to current NFL commissioner Roger Goodell's recent comments. When NBA commissioner Adam Silver declared his support for legalized sports betting in November 2014, he changed the game for the other leagues. But will it be enough to move the line? David Purdum explores in ESPN The Magazine's Gambling Issue in 2015. Note: This series was originally published ahead of the Supreme Court's decision. In Part 1 of Chalk's series, we examine what the legalized sports betting market could look like. If sports betting is legalized in the U.S., recreational bettors will have far more options, such as gambling hedge funds. But they will also have increased competition. And not only from humans. Some say legalized U.S. sports betting is the wrong move. Experts point to potential increases in problem gamblers, harmful advertising and gambling scandals. But is it all doom and gloom? Fantasy sports have never been more popular. Single-game sports betting is legal only in Nevada. However, the line between the two is blurring rapidly.